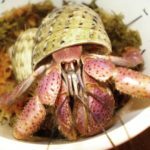 I had three hermit crabs and two died to PPS so my one crab is by himself for now.The closest place to get hermit crabs is about an hour away and they are kept in TERRIBLE CONDITIONS(it’s where I got mine because there isn’t anywhere else) so I don’t want to support them at all.Whats halls opinion on ordering crabs online and having them shipped?Are the crabs okay free being shipped?And where do y’all recommend ordering from? There is just as much of a chance of the crabs being kept in bad conditions from wherever you order from, and you will never get the chance to see. Mailing can work, but it is very dangerous in cold temps and in very hot temps. The hot and cold packs used during shipping can fail and these guys have a very limited temperature range where they are safe. We don't recommend mailing below 68 degrees or above 85 for safety. Boxes can also get lost or delayed in the mail which will equal getting a box of dead crabs. They are so cheap that companies that sell them won't go through as much trouble as they would for a $100+ reptile.